Located in downtown Miami’s “Museum Park” and next door to the Perez Art Museum Miami (PAMM), the Phillip and Patricia Frost “Museum of Science” was built in 2017 and has quickly become a popular museum for local residents and tourists visiting Miami, FL. The Frost Science Museum was designed by NYC’s Grimshaw Architects and encompasses 250,000 sq. ft of fun and educational activities for all ages. With an emphasis in STEM, the Frost is sparking in an interest in science through an interactive setting where guests can touch, play, and interact with the exhibits and animals! Frost Science inspires people of all ages and backgrounds to enjoy this unique Miami museum that houses a 3 in 1 museum that features a planetarium, aquarium, and science museum all for the price of 1 ticket. It is the first museum that has an aquarium and a planetarium in the same space. If you are going to visit the Frost Museum from downtown West Palm Beach, you can easily take the Brightline Train from the Clematis Street station south to Miami and easily connect via MetroMover to the Frost / PAMM stop. Here is a glimpse of what you can see and enjoy at the Miami Science Museum. The highlight of the Frost Science Museum is definitely its stunning three-level aquarium that contains multiple ecosystems, habitats, and subaquatic depths. Begin at the open-air rooftop that represents the ecosystem of Florida. You will find here pelagic fish like devil rays, mahi-mahi and hammerhead sharks in the open waters of the Gulf Stream Aquarium. You will also see sandy beaches, coral reef and mangroves which are a part of Florida’s ecosystem. 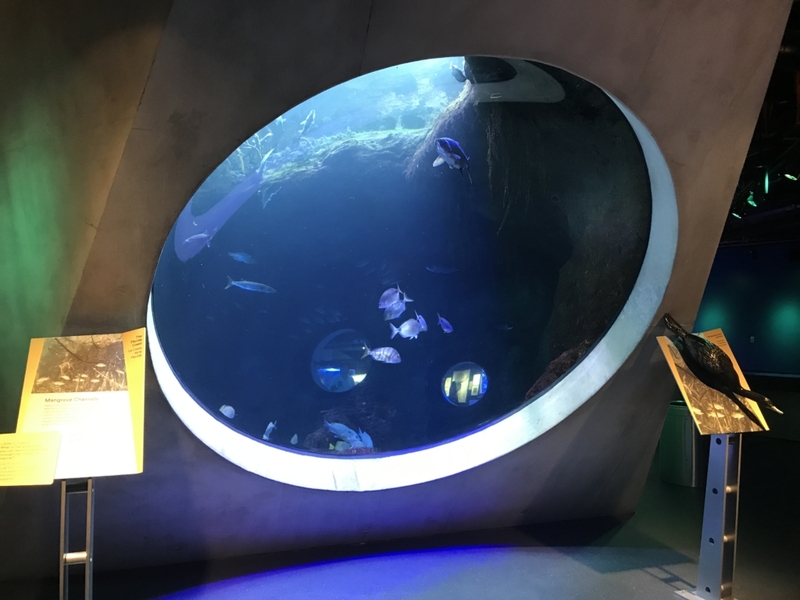 The second level has about 30 aquariums and interactive pods. You will find here everything from parrotfish to damselfish and snappers swimming between coral heads. The bottom level of the aquarium represents the vastness of the Gulf Stream. You will learn about the impact of the powerful currents of the Gulf Stream on the ecosystem and climate of the world. One of the most cutting-edge and state-of-the-art planetariums in the world, the Planetarium at Frost Science Museum has 250 seats and is powered by a visual system of 8k resolution. There are 3-D projectors with surround sound and 16 million colors. The planetarium is tilted as a 23.5-degree angle forward where the viewers can enjoy a 360-degree virtual experience in the planetarium spread at 67-foot. Whether you are interested in the deep sea or the planets up in the galaxy, the Frost Science Museum offers a glimpse of it all with a short trip from downtown West Palm Beach, FL.